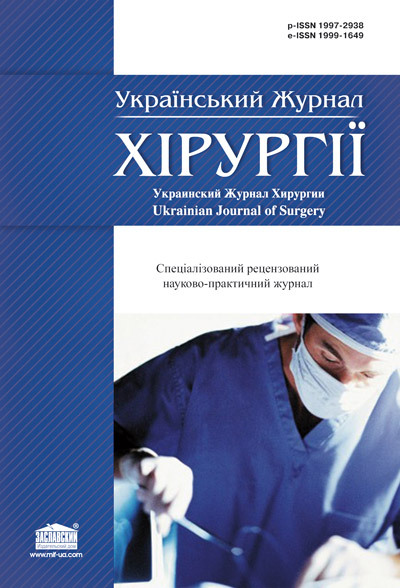 The journal Ukrainian Journal of Surgery (Ukraïnsʹkij žurnal hìrurgìï) is the professional scientific-practical specialized peer-reviewed journal for surgeons, anesthesiologists, intensive care specialists, emergency physicians, covering scientific and practical developments in the field of surgery. The founder: Donetsk National Medical University, Association of surgeons of Donetsk region. Registration Certificate: КВ № 19629–9429ПР. Issued by the Ministry of Justice of Ukraine 11.01.2013. The journal is included in the new List of scientific publications of the Higher attestation Commission, which can publish results of dissertations on competition of scientific degrees of doctor and candidate of Sciences. Order of the MES from 12.05.2015 № 528.